Finding interesting things to barbecue for vegetarians can sometimes be a problem. Once we went on a tour of Szechuan province in China. We had a lovely selection of barbecued vegetables on street shops, they were delicious! They would BBQ any seasonable vegetable available and sell them on street stalls. Make 1-2 BBQ sticks per person. I have given a selection below, you can try some or all of them for your next BBQ. Look out for other vegetables too. Also see BBQ Selection and Marinade Selection. 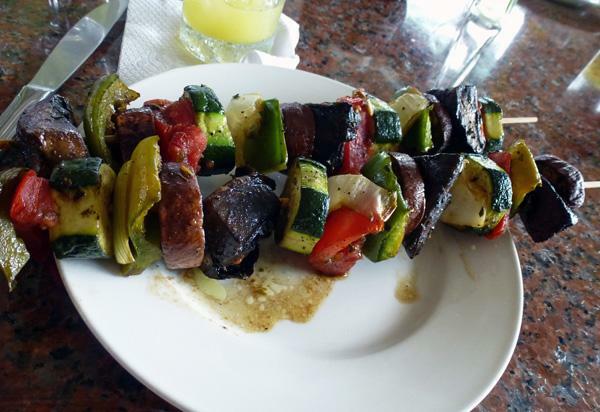 Experiment with other vegetables and with different marinades. A packet of Bamboo skewers, soaked in water for 30 minutes and drained. This stops them from burning. 3-4 lotus roots slices (Kamal Kakri or Kamal Gatta or Bhein/Bhain/Bhen), parboiled. Fresh, Chinese ones are better in texture than the Indian ones. Try to avoid ones with broken ends, they can be full of mud. Prepare vegetables as given under ingredients. Lotus roots: Scrap lotus roots, cut top and tail ends and slice into 1 centimetre thick slices. Lotus roots grow in ponds and often have mud inside their tubular holes. Wash thoroughly, making sure that no mud is left inside. You will understand this, when you see a lotus root! Place all vegetables in a bowl and add all marinade ingredients. Mix well, but gently, to coat each piece of vegetable. 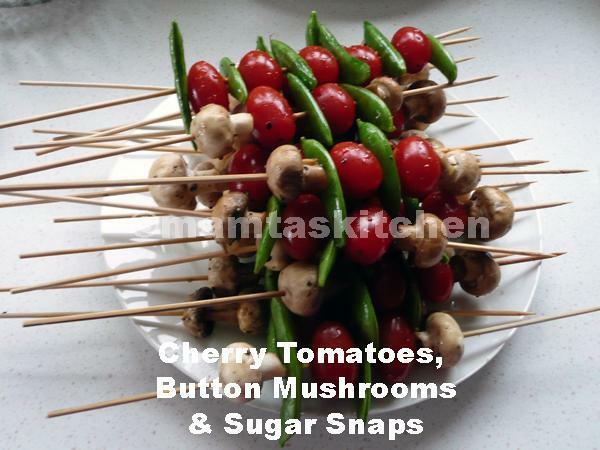 Thread vegetables as you like onto the skewers. Lotus roots can be cooked on their own. Thread 2-3 slices per skewer through their diameter so that the circles are lying flat one above the other, like a lollipop. Barbecue until beginning to look slightly burnt and enjoy.